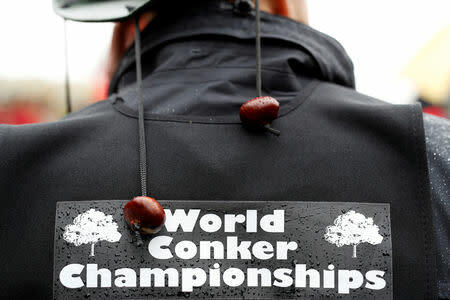 The quintessential British school playground pastime involves competitors taking it in turns to launch their conkers in a bid to break those of their opponents. Victory can also be claimed if you force your opponent's shoelace to become knotted three times. "Being steady of hand, steady of mind and able to withstand the cold and the wet is also very important," said competitor Mina Arsanious, who was joined in the international field by rivals from Australia and the United States.